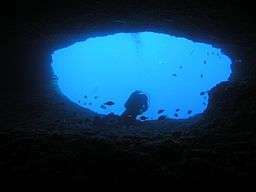 Cave diving is an extreme sport in which a diver visits water-filled caves. The equipment used varies depending on the circumstances, and ranges from breath hold to surface supplied, but almost all cave diving is done using scuba equipment, often in specialised configurations. 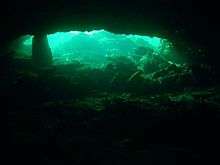 Cave diving is generally considered to be a type of technical diving due to the lack of a free surface during large parts of the dive, and often involves decompression. Air (gas) management: The most common protocol is the 'rule of thirds,' in which one third of the initial gas supply is used for ingress, one third for egress, and one third to support another team member in the case of an emergency. UK practice is to adhere to the rule of thirds, but with an added emphasis on keeping depletion of the separate air systems "balanced," so that the loss of a complete air system will still leave the diver with sufficient air to return safely. The rule of thirds makes no allowance for increased air consumption that the stress caused by the loss of an air system may induce. Dissimilar tank sizes among the divers are also not included by the rule of thirds, and a sufficient reserve should be calculated for each dive. UK practice is to assume that each diver is completely independent, as in a typical UK sump there is usually nothing that a buddy can do to assist a diver in trouble. Most UK cave divers dive solo. US sump divers follow a similar protocol. The rule of thirds was devised as an approach to diving Florida's caves - they typically have high outflow currents, which help to reduce air consumption when exiting. In a cave system with little (or no) outflow it is mandatory to reserve more air than is provided by the rule of thirds. Cave divers were taught to remember the five key components with the mnemonic: "The Good Divers Always Live". New available technology and diver experience are no longer matching the initial phase of local cave diving accident analysis. In the early phases the analysis shows that 90% of accidents were not trained cave divers; from the 2000s on the trend has reversed to 80% of accidents involving trained cave divers. Modern cave divers' capability and available technology allows divers to venture well beyond traditional training limits and into actual exploration. The result is an increase of cave diving accidents, in fact in 2011 alone the yearly average of 2.5 fatalities a year triple. Furthermore, in 2012 fatality rate average had already been surpassed and actually reach the highest peak ever at over 20. As response to the increase in fatalities during the years 2010 onwards, the International Diving Research and Exploration Organization (IDREO) was created in order to "bring awareness of the current safety situation of Cave Diving" by listing current worldwide accidents by year and promoting a community discussion and analysis of accidents through a "Cave Diver Safety Meeting" held annually. 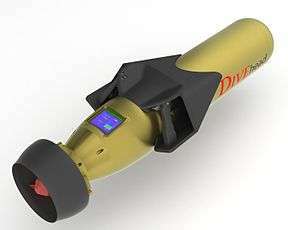 Specially designed diver propulsion vehicle for cave diving. Scuba configurations which are more often found in cave diving than in open water diving include independent or manifolded twin cylinder rigs, side-mount harnesses, sling cylinders, rebreathers and backplate and wing harnesses. Bill Stone designed and utilized epoxy based tank for exploration of the San Agustín and Sistema Huautla caves in Mexico to decrease the weight for dry sections and vertical passages. Diver propulsion vehicles, or Scooters, are sometimes used to extend the range by reducing the work load on the diver and allowing faster travel in open sections of cave. Reliability of the diver propulsion vehicle is very important, as a failure could compromise the ability of the diver to exit the cave before running out of gas. Where this is a significant risk, divers may tow a spare scooter. Dive lights are critical safety equipment, as it is dark inside caves. Each diver generally carries a primary light, and at least one backup light. A minimum of three lights is recommended. The primary light should last the planned duration of the dive, as should the backup lights. Cave diving training includes equipment selection and configuration, guideline protocols and techniques, gas management protocols, communication techniques, propulsion techniques, emergency management protocols, and psychological education. Cave diver training stresses the importance of safety and cave conservation ethics. Most training programs contain various stages of certification and education. The cave diving community is a global one, partly due to the highly specialised nature with the resulting small numbers of practitioners at a local level. Cave diving practice can differ markedly by locality. One such difference is the use of a floating polypropylene guide line. Most cave divers in the U.S. balk at the use of any sort of floating guide line, 6 mm nylon line is the norm in UK and is regularly anchored to stones, lead weights, or whatever is needed these belays are laid clear of mud and silt. In continental Europe, thinner yet slightly buoyant line is typical. Cave diving practices in some localities may be different than those in other parts of the world because those caves require specialized techniques. Two regions have had particular influence on cave diving techniques and equipment due to their very different cave diving environments. These are the United Kingdom, and USA, mainly Florida. Progress was typically by "bottom walking", as this was considered less dangerous than swimming (note the absence of buoyancy controls). The use of oxygen put a depth limit on the dive, which was considerably mitigated by the extended dive duration. This was the normal diving equipment and methods until approximately 1960 when new techniques using wetsuits (which provide both insulation and buoyancy ), twin open-circuit SCUBA air systems the development of side mounting cylinders, helmet-mounted lights and free-swimming with fins. The increasing capacity and pressure rating of air bottles also extended dive durations. In the United States, Sheck Exley was a pioneering cave diver who first explored many underwater cave systems in Florida, and many throughout the US and the world. On February 6, 1974, Exley became the first chairman of the Cave Diving Section of the National Speleological Society. Since the 1980s, cave diving education has greatly reduced diver fatalities, and it is now rare for an agency trained diver to perish in an underwater cave. Also in the 1980s, refinements were made to the equipment used for cave diving, most importantly better lights with smaller batteries. In the 1990s, cave diving equipment configurations became more standardized, due mostly to the adaptation and popularization of the "Hogarthian Rig", developed by several North Florida cave divers, named in honor of William "Hogarth" Main, which promotes equipment choices that "keep it simple and streamlined". Boesmansgat is a sinkhole in the Northern Cape province has been dived to 282.6 metres depth. Jordbrugrotta is the deepest cave in Northern Europe. One deep underwater cave in the USA is Weeki Wachee Spring. 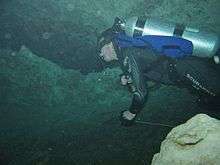 Due to its strong outflow, divers have had limited success penetrating this first magnitude spring until 2007, when drought conditions eased the out-flowing water allowing team divers from Karst Underwater Research to penetrate to depths of 400 feet (120 m) The current deepest known underwater cave in the USA is Phantom Springs Cave located in west Texas. Phantom Springs has been explored down to 462 feet (141 m) in water filled cave passages. This makes it the deepest known underwater cave in the USA as of 2013. 1 2 3 4 5 6 7 8 9 10 11 12 13 14 15 Exley, Sheck (1977). Basic Cave Diving: A Blueprint for Survival. National Speleological Society Cave Diving Section. ISBN 99946-633-7-2. 1 2 3 Devos, Fred; Le Maillot, Chris; Riordan, Daniel (2004). "Introduction to Guideline Procedures - Part 2: Methods" (pdf). DIRquest. Global Underwater Explorers. 5 (4). Retrieved 2009-04-05. ↑ Bozanic, JE (1997). "AAUS Standards for Scientific Diving Operations in Cave and Cavern Environments: A Proposal.". In: SF Norton (ed). Diving for Science...1997. Proceedings of the American Academy of Underwater Sciences (17th Annual Scientific Diving Symposium). Retrieved 2008-07-05. ↑ Nick Lewis. "Dark Water: The Cave Diver's Mnemonic-'The Good Divers Always Live': Training, Guide Lines, Depth, Air, Lights-Highlights the Importance of Preparation as Well as Specialist Gear for Those Taking Part in What Can Be an Extremely Dangerous Sport. Nick Lewis Describes What's Involved". Geographical. Retrieved 18 April 2016. ↑ "Florida State Warning Sign (GIF)". National Speleological Society. Retrieved 18 April 2016. ↑ "AAP, Accident Analysis Project". International Diving Research & Exploration Organization. 2015. Retrieved 23 May 2016. ↑ Stone, WC (1986). "Design of fully redundant autonomous life support systems.". In: Mitchell, CT (eds.) Diving for Science 86. Proceedings of the American Academy of Underwater Sciences Sixth Annual Scientific Diving Symposium. American Academy of Underwater Sciences. Retrieved 2016-01-07. ↑ "History of Stone Aerospace". Retrieved 2016-01-07. ↑ "Jack Sheppard". Cave Diving Group. Retrieved 2007-12-29. ↑ Farr, Martyn (1991). The Darkness Beckons. London: Diadem Books. ISBN 0-939748-32-0. ↑ Staff. "Cave Diving Section of the National Speleological Society was founded". cavedivinghistory.com. Retrieved 2009-06-01. ↑ "Filipino Cave Divers". Retrieved 28 February 2014. ↑ "Training". Cave Divers Association of Australia. Retrieved 6 April 2013. ↑ Horne, Peter (1987). South Australian Diving Fatalities 1950-1982 (2nd ed.). Adelaide, South Australia: Peter Horne. pp. 60–63. ISBN 0959438335. 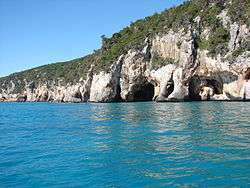 ↑ "Diver forced to leave dying mate to drown in cave". The Age. Fairfax Media. March 15, 2010. Retrieved 6 April 2013. ↑ "Grim task to retrieve lost diver Agnes". The Sydney Morning Herald. Fairfax Media. February 28, 2011. Retrieved 6 April 2013. ↑ Dougherty, Tom (October 17, 2011). "Victorian man dies while cave diving in Tank Cave, Mt Gambier". Herald Sun. The Herald and Weekly Times Pty Ltd. Retrieved 6 April 2013. ↑ "Verdens dypeste sumpgrotte". NRK. ↑ "Dominican Republic Speleological Society". Retrieved 28 February 2014. ↑ Kernagis DN, McKinlay C, Kincaid TR (2008). "Dive Logistics of the Turner to Wakulla Cave Traverse". In: Brueggeman P, Pollock NW, eds. Diving for Science 2008. Proceedings of the American Academy of Underwater Sciences 27th Symposium. Dauphin Island, AL: AAUS;. Retrieved 2009-06-01. ↑ Neill, Logan; Anderson, Joel (2009-04-20). 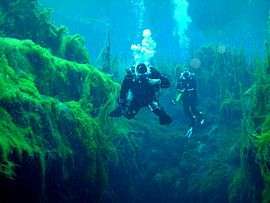 "Cave divers explore deepest parts of Weeki Wachee Springs". St. Petersburg Times. Retrieved 2009-06-01.